Can’t bring your dog on your next trip out of town? Don’t worry; we offer the perfect home-away-from-home. Whether you need to leave your dog for one day or one week, we’ll make sure your pup is happy and healthy while you’re away. Your furry friend will be in great hands and treated like a member of our own family. 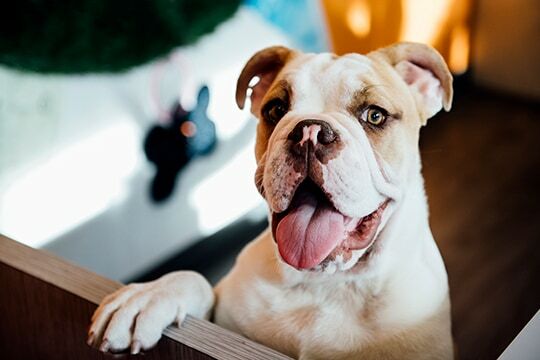 During your dog’s stay at Dogtopia of South Coast in Santa Ana, they will be given the opportunity to play with others during the day in our fun-filled playrooms. Your pup will stay active as they run around with their BFFFs (best furry friends forever) for a total of 9 hours each day (with a 2-hour rest period). See for yourself by checking out the webcams in each of our playrooms. Your pup will be played out after a fun-filled day of play. Bedtime is around 8pm until 6:30am. We used home-style crates so they have a safe, personalized area to rest in. Larger units are available, which are called Suites, and can be reserved for a nominal fee. We require each dog to come into our facility beforehand for a meet and greet evaluation. This ensures your dog will be well suited to play with all other dogs in our open-play environment. Since every dog is different, we want to know what your dog likes and dislikes to make their stay as enjoyable as possible. At the meet and greet session, we’ll get the opportunity to learn about your pup so we can give them the best experience possible. Our team is filled with dog-loving experts who know how to care for all types of breeds and temperaments. We strive to make every pup in our care feel at home, which is why we strongly encourage pet parents to bring their dog’s usual bedding, toys, and food. Dogtopia of South Coast can also provide food for all daycare and boarding dogs for a small fee. We offer dog boarding at prices designed to fit any budget. We’ll take the time to help you determine which package will best suit your dog’s needs as well as your own. We recommend reserving a spot in advance as space for our overnight boarding is limited.